From the small town of Vidin in Bulgaria, on the eddy-filled Danube, a teenaged boy called the pompous town fascist leader a peculiar part of a dog’s anatomy, and was murdered for it. His older brother, Khristo Stoianev, then found himself as the opportunistic target of a communist NKVD officer who watched everything closely. Khristo’s bitterness for fascists made him an easy mark. And so, with some talk and promise, off to Soviet spy school went our hero. This book is a grueling tale of Khristo’s journey from one life to another, several times. It is sweeping in scope, yet gets down into the quiet thoughts of frightened men. In Moscow, Khristo endured the hard lessons of being a suspicious and well-trained Soviet spy. He shone and made friends as an operative in Spain during the civil war. He landed in pre-war Paris as the grand old town sought one last hurrah before war, and tried hard to fade into the life of a regular guy. From here Khristo traverses the war in various extreme conditions, all of them gritty and dangerous. We get a sense that the author knows the customs and conditions on the ground in all the many places we visit. The story takes the reader from Vidin to Arbat Street in Moscow in winter. We are trembling with fear in the bowels of Lubyanka prison. We walk exhausted on dry paths to small villages in Spain, and we climb drain pipes and flee through the night on Madrid’s cobbled streets. We get to enjoy the socialite scene in gay Paris, and its seedier side. We are taken to the uninspired corporate offices of an ad agency in New York City to meet a dead-end career, then to the hills of the French countryside under cover of darkness. We travel through Warsaw, Prague and many small ports of call along the old Danube river, and meet a number of people – good and not so good – along the way. All the while keeping a good cover story and never taking the same way twice. And doubting everyone. What a deliciously well-written book of dense color, grit and skilled writing. It sweeps from the mid-thirties to 1948, and weaves a story of secret lives that are masterfully colored. I was gripped with amazement at the manner of writing more than any other book I’ve read and often ran to my wife, a book lover as well, saying “listen to this!“. Descriptions of places and smells and sights that bring them to the mind as if the reader was merely remembering them from yesterday. Little looks of a face, muscle moves so subtle, yet clear. A shift of eyes, an imperceptible nod. Bluntness when a blow needed to be felt. Steam on windows, grit in teeth, the stick of blood on the floor. Fever, the sewing machine sound of a poorly tuned Tatra, bad food, old sweat. It was all vividly crafted. I read and re-read many sections just to delight in descriptive writing. I was pleased when the author taught principles through situations, some literal – like the use of a chess board and a cheating headmaster to teach Khristo that wicked lie, “the ends justify the means.” Some not so literal, like the depressing case of the San Ximene figs. In the Spanish Civil War chapter, Blue Lantern, Furst used the locally famous San Ximene Figs as a vehicle to communicate the futility of bureaucracy and the madness of war. It was so very artfully crafted I was beside myself. As for the story, many have complained how it plods along. Indeed, it develops a little slow, but just as I would begin to wonder where the plot is heading, a grand twist hit me in the gut. The plot allowed time to breathe, and for more satisfying pictures to be made of this kitchen or that rooftop. And while Furst will lavishly develop a character only to have that character killed off, I think that makes fantastic storytelling. I also like Furst’s clear philosophical ponderings. 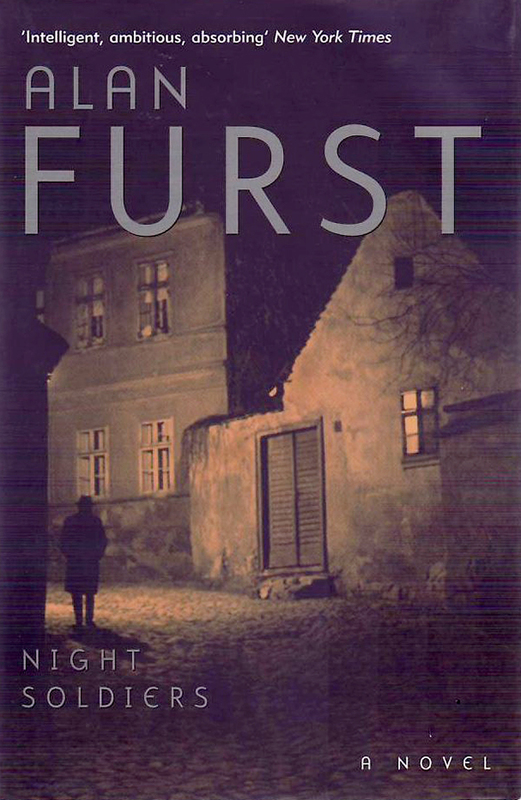 Furst tells the blunt truth about WWII, the life of a spy, and tyrants in general. It is painfully clear, usually made so because of some interrogation room, that tyrants are all are the same. Death and futility come with communism and fascism, no matter if the uniform is feldgrau or Оливковый. Everyone seemed to face one question: Which boot to lick? The many flavors of politics, and competing factions, especially in the Spanish Civil War, confuse and confound and give a sense of authenticity to the story. It is not a flat “Nazis and Communists and Americans” tale of war. It is a dense web of rivalries and loyalties even within the same “side” that better represent the ability of men to make messes of things. This complexity is clearly in the grasp of the author. He seems well to know his stuff. And that just supplies a confidence in the reader that what we are getting is not just made-up fiction, but fiction steeped in historical context. You can actually learn something from Alan Furst. Highly recommended. This is a book for adults. It is not graphic but frank, not grisly but realistic. Take character notes as you go, there are a lot of them. Some you will scratch off sooner than others, some will turn up again. You’ll want to follow along places on Google Earth, get down into Street View, especially in Paris while listening to Edith Piaf croon about lost love when walking the street of Paris. I’m picking up another Furst book right away.